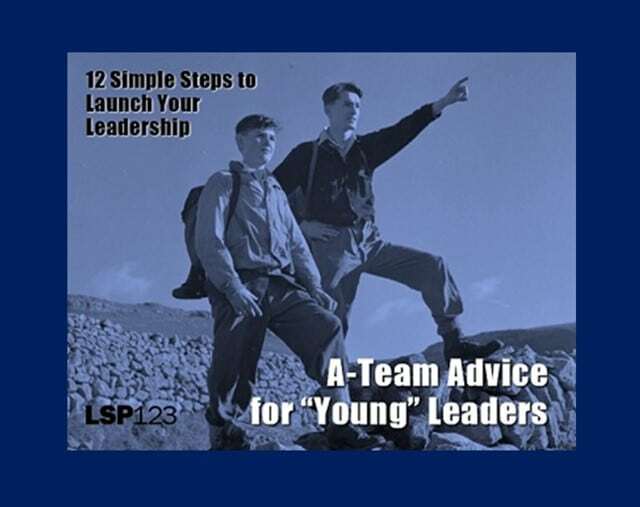 12 Steps to Launch Your Leadership. Are you a young leader? Regardless of your age, have you recently accepted a new leadership role? Perhaps you’ve done well in a job and were moved into a different position with more responsibility. Did someone think highly of you and now believes you can lead others? Maybe your start-up has grown or a sudden change left you as the logical person to take on a bigger assignment. No matter how you got there, the expectation for you to perform, get results, and behave in a certain way has likely risen. You will most certainly feel a mix of emotions that include excitement, eagerness, and pride as well as anxiety, uncertainty, and fear. Congratulations new “young” leader! Focus on Others. If in your past you found yourself focusing on your own job, your own performance, your own responsibilities and your own self, a new leadership role is the perfect time to make a shift – toward others. In every situation now, be very mindful of other’s roles, other’s contributions, other’s input, and other’s needs. To be a better leader you will certainly need others, so now is a great time to consider them first and yourself later. Ask yourself, who can you help and how? Try regular one-to-one meetings that provide dedicated time for you to focus on another. Learn to Listen. You may have been in a position where everyone came to you for input and solutions. As a new leader it is very likely that your role has changed. While you may still have valuable perspective and advice, as a leader it will be critical to engage others on your team for their input, buy-in, and to leverage the wisdom and experience they can offer. Why go-it-alone which can significantly lower your results and leadership equity? If you struggle to pause and listen, try asking a question and (in your mind) counting to ten before you continue, interrupt, or move on. Minimize Your Emotions. Avoid the temptation to be too positively or negatively expressive. This means don’t get overly frustrated, disappointed, or angry with others. You don’t want to be a boss who regularly (or even occasionally) flies-off-the-handle. This can cause everyone to hold back their input and involvement, fearful of your unpleasant or unpredictable outburst. Likewise, be careful to not excessively approve, praise, or love-on others. Be genuine with your feelings, but don’t overdo them in ways that can diminish their authenticity and impact. Most prefer an emotionally even-tempered leader. Reserve Judgement. Be slow to draw conclusions, especially about others. Seek to understand the deeper context of a situation before you judge. Every person and every situation has a story, and each with their pros, cons, strengths, and weaknesses. What may appear to be either a “smart” or a “dumb” decision at first, may look different when fully considered. As a leader, one of your top responsibilities is to ensure that all relevant inputs are considered before conclusions are drawn or decisions are made. Check yourself by thinking of situations you assessed months ago and what you later came to learn were additional factors. Uncover Your Insecurities. There are few things more sad or scary than a highly insecure leader. Leaders who are not secure about their roles, their relationships, or themselves often make decisions and behave in ways that are harmful or even dangerous to everyone around them. Their attempts to feel better often come via comparisons to or competition with others. Win-lose thinking prevents win-win alternatives. If you can explore, uncover, and address the things that make you feel most vulnerable, you can offset many of them with things that give you strength, stability, and confidence. Beyond yourself, maintain a sensitivity to the insecurities of others and look for opportunities to lift-them-up rather than tear-them-down. Don’t be the Smartest in the Room. No one likes a know-it-all, and few of them know nearly as much as they think. When together with others in a meeting or similar setting, better to hold back, ask great questions, listen carefully, probe selectively, and then maybe consider offering your input but with careful discretion. Sometimes, offer little or no input and let someone else be the smartest in the gathering. Regardless of what you’ve done or think you know, don’t act like it’s more than others. Pick Your Words Carefully. Words are often your most powerful tools as a leader, so use them wisely. Learn to appreciate, understand, and select them better. Seek words that promote clarity and understanding. Choose words that offer support and encouragement. Second, avoid some words altogether, especially words that are profane, put-downs, or hateful. Yes, this means stop cussing. Contrary to what some believe, bad words don’t make you look strong, smart, or funny and they don’t impress the people who matter most in your life, especially your spouse, children, siblings, parents, or other family members. Remember that your co-workers, professional associates, and even friends most certainly see you as less controlled, competent, and respectable when you bark a bad word. Bad words are common in our culture, but need not be by you. Avoid Sarcasm. Sharp tongued remarks are used by some to appear clever, funny, or as an attempt to fit-in with a group. When these remarks draw attention and laughter (or worse) at the expense of another person, they almost always have the very opposite effect. Sarcasm most often hurts feelings, hurts relationships, and hurts others. Anyone who is smart and quick enough to be sarcastic, can easily shift this bad habit to being more situationally aware, sensitive, and supportive of others. Replace sarcasm with uplifting and encouraging remarks, and watch your relational equity rise. Connect with Other Leaders. There are few better ways to learn how good (and bad) leaders behave than by regularly meeting with others who are in similar roles or situations. Consider participating in professional groups, peer roundtables, community committees, or book studies in your area. Show up and watch how these leaders connect and communicate. Look for different leadership approaches and styles. Try to understand why people behave the way they do, and how it makes you feel. Who leads well, who doesn’t, and why? It’s too hard and risky to lead alone, so find others who you can learn from and be inspired by. Volunteer. Find a non-profit or similar organization where you can work and lead solely for the benefit of others. Every region has numerous community, professional, faith-based, education, and other worthy causes. Notice which leaders are showing up there, and why. Many of the best community leaders can be found sharing their time, talents, and treasure with the best non-profit organizations, often in low-profile roles and for no compensation whatsoever. Go and learn from them, while you help a good cause. Stay Grounded. Great leaders find deliberate ways to stay humble and grateful. Faith, family, and friendships often serve this purpose, yet too often busy leaders don’t make enough time to connect relationally with God and church, direct and extended family, or old and new friends. By investing early and often with these relational groups, strong leaders stay balanced, in touch with others and their real-world issues, and have a support network in place for times when it will inevitably be needed. Invest in leadership maturity. Great news – good leaders are not born, they can be developed. Leadership is where many organizations can most leverage their results, but it requires a dual effort. Individuals must first accept their responsibility to learn and grow. Organizations are then wise to support them and invest in their development. As the competence and character of an organization’s leaders mature, A-Teams are formed and everyone wins. Rob Marchalonis (Rob@LSP123.com) helps business owners and leaders increase employee productivity and morale with various leadership, strategy, and process solutions. Email, or message Rob on LinkedIn.